And I do often forget. Because life keeps intervening and pushes me scatter helter skelter into rescuing fainting daughters as they whimper from the bathroom or unblocking random cell phone calls that blink “blocked” with every ring (that will be tomorrow’s post). 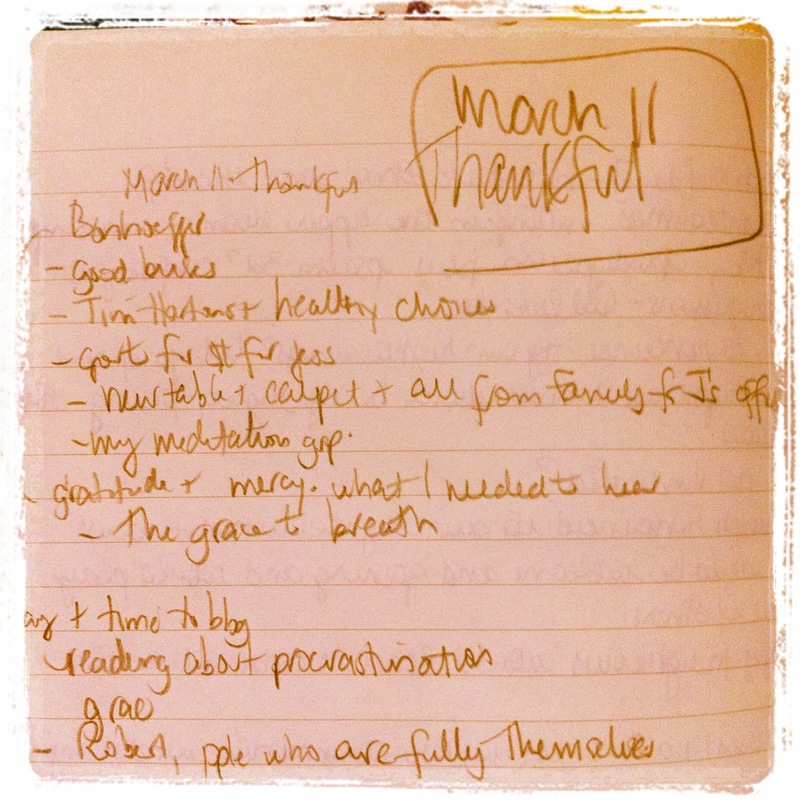 But since thankful is now my evening Lenten practise, I have a list to remind me of what I am thankful for, even if the day scoots out from under my keyboarded fingers. 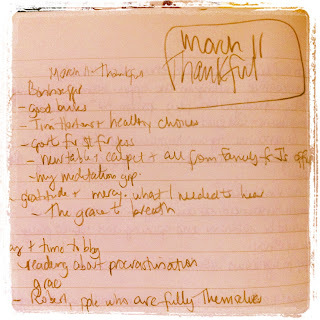 Bonhoeffer & Mama Monk for helping me give thanks for the small. Good buses that get my daughter to work on time, even when she gets up late and stomps/slams her way out the door. Tim Horton’s healthy lunch choices (chicken salad sandwich, 380 calories … and thankful for the internet that lets me look that up!) that let my daughter defy our best advice rebel by choosing to buy her lunch out as often as possible. The new old pine coffee table and Persian carpet (from my family home) finally laid out in our living room that allow Jessie and the cat to work and nap in comfort. My Monday meditationgroup that returns me to my family and myself with a new measure of hope and hopefulness, even in this desert time. 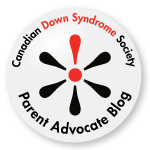 Delayed contracts that give me time to think, blog, wrestle with transition daemons (meaning mostly myself and my need to control). Jessie’s increasing independence that allows Dan and me to BOTH pursue our passions, even at the same time! And you? What are you thankful for? Come and share over at Mama Monk. My brother keeps talking about Tim Horton's. I've never heard of it, but he loooves it. I love all the things to be thankful for! Whenever I try to post lists like this, they always end up sounding so same-old, same-old, like I'm thankful for health, family, Samantha, etc. I like how you think outside the box! How does your bro know Tim Hortons????? I'm loving the samantha photo and all the bright colours! I love that keeping a thankful list is your Lenten practice, Nancy. Thanks for sharing. I haven't read much Bonhoeffer at all. Another author to add to the never ending list! Where should I start? Discipleship or Life Together ... or, as with me, just start dipping in with the 40-day journey! Thanks for hopping over her Micha! My Bite-Sized Contribution . . .